30 April 2012 is a memorable day in my life. 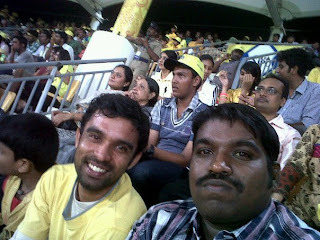 A friend of mine rang me up and said " lets go to the cricket stadium to watch the match between CSK and KKR". I was thrilled because that was going to be my first IPL match at the stadium. So after work, the car raised towards the Chepauk stadium. The atmosphere was electrifying. We got a wonderful place to sit and I realized that watching a cricket match in a stadium is way better than watching it on TV. The excitement factor is all that makes the difference. The chants, the mexican waves that were totally asynchronous and the yellow color jerseys, the placards, the facepaints, the dances, the flags - they all brought a piece of excitement for everyone in the stadium. Being an ardent Chennai Super Kings Fan, I was proud to wear the yellow jersey and sit in the crowd full of CSK supporters. But call it pure evil plotting by the organizers, a bunch of KKR supporters ended up sitting behind me. All of them were Bengali girls. The match started and Chennai was asked to bat. I eagerly waited for some huge sixes from the great Chennai batting line up. Raina scored one and and that too just cleared the boundary line by a small margin. No huge sixes to the stands and that was a bit of disappointment. Brett Lee was standing near the boundary line fielding for KKR and we made fun of him. But he was such a sport. He was very quick too. His fielding was great and he had such a strong throwing arm. No wonder he stood in the boundary. In one of his dives, he pants tore and we can see his whole legs through the slit. He started to plead with Gambhir to allow him to go to the dressing room and change. But Ghambir told him NO. The naughty Yusuf Pathan started teasing Brett Lee and it was a sight to see. These incidents would have never been caught on camera and those who watched the match on TV sets would have definitely missed these actions. How could I ever write about IPL without a mention about the cheer girls. There were 4 platforms near the boundary at four corners of the ground. In two of these platforms KKR cheer girls were dancing and in the other two platforms CSK cheergroup danced. They danced for everything. Suddenly mid way through the CSK innings, drums shivmani made his entrance and there was a big roar in the crowd. He would carry his drums and go from one platform to another and he started playing drums from each of these platforms. When someone from the crowd appeared on the big screen, they became hysterical. Some painted their faces in all colors. Some had painted their bodies. Some had different color wigs. One such person was mistook by a few for Mallinga. Some had placards in their hands. A poor little girl held a placard through out the match with hopes of appearing in the big screen. The bad camera man did not even capture a glimpse of her. She was very sad. Around the 12th over of the CSK innings, the girls behind me started to cry out loud as if they all had a sudden attack of dysentery. I turned around and saw some of them crying and some of them going berserk with their hand-leg-body movements. One girl almost fainted. I was shocked for a moment and I thought some weird virus had attacked them. But when I saw them closely, I noticed that all of them were looking in one direction of the stands. I looked at that direction and I found the virus which caused all this. Yes SRK had made his appearance to the stadium. This is what IPL is all about. 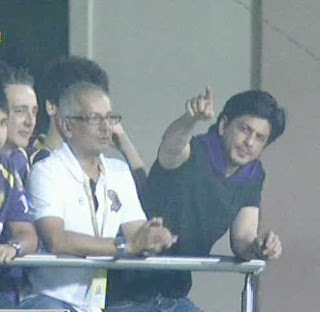 World class cricketers playing a wonderful game of cricket and girls in the stands ogling at SRK in the stands. One know-it-all old man was sitting in front of me and he was saying something or the other. When Hussey was run out he said that the match was fixed. Then when Raina got out he said that IPL was just like WWE wrestling where everything is pre-planned. I felt like pushing him down from the stands. But when I saw that he good muscles, I controlled myself. CSK did not score a big total and KKR chased them easily. The guys who sold snacks made merry. One cup of coke was sold at 40 bucks. Dry chappathy with cabbage inside it was sold for 50 bucks. It was nightlight robbery. But still we bought those and ate it. Chriz where are the Bengali Girls ? 517. நா எதுக்கு சரி பட்டு வர மாட்டேன் ? 516. The girl who turned my world upside down.